Place sweet potatoes in large saucepan and cover with water. Add salt and bring to boil over medium-high heat. Cook until potatoes are tender but still firm, 7 to 8 minutes. Drain and let cool. Peel cooked sweet potatoes and dice into 1/2 by 1/4 inch cubes. In large skillet, heat oil and butter over medium heat. Add garlic and chile pepper and cook, stirring often, 1 minute. Increase heat to high and add corn , onion, and green onions. Stir well to coat and season with salt and pepper. Cook, stirring occasionally, until corn is nicely charred, about 5 minutes. 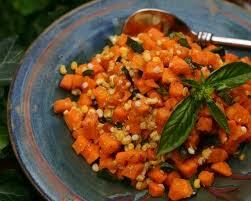 Gently stir in diced sweet potatoes, being careful not to crumble them. Reduce heat to medium and cook until potatoes are browned, about 10 minutes.